Flamenco Loco and special guests Claudia Caolín (from Claudia Caolín y Compania) and Aneta la Polaca have collaborated on this very special mutli-media production: ‘Flamenco para Siempre’, featuring a plethora of truly authentic Flamenco dance and music pieces, vivid costumes and passionate choreography. The two Flamenco women, Aneta from Poland, known for her strong technique and personality, and Claudia Caolín, experienced and elegant dancer resident on British soil, will show what hidden passions can reside in the human soul. 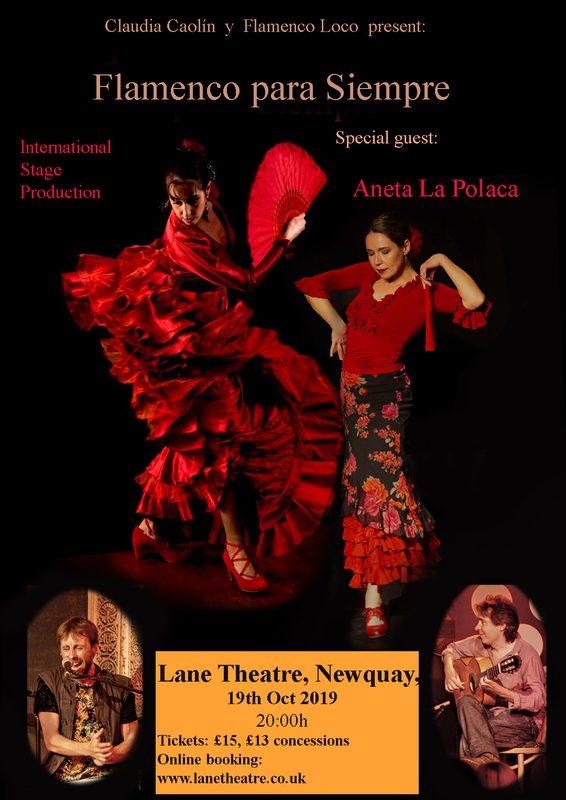 They are joined by stunningly virtuous Flamenco guitarist Jamie Cuthbertson (Cuffy) and versatile singer Jaime Cantera. For this special evening a kaleidoscopic journey to the manifold styles of Flamenco awaits, from a nostalgic, historic feast of the senses to a modern, streamline interpretation, underlined by acoustic fireworks. The artists are linked by their common desire to bring some of the alegria and passion for life of the colourful culture of Southern Spain to the equally beautiful, if somewhat colder, Northern shores. Apart from the hauntingly beautiful live music, Flamenco para Siempre uses shadow projection and image projections to enhance the visual impact and thus tell untold stories in a new and innovative way. It aims to capture the pathos, drama, colour and excitement inherent within the experience of Flamenco.